The successor to the legendary OnePlus 3T may have been inadvertently leaked on Oppomart, a popular online Chinese marketplace. According to the leaked product page, the list image is the same as leaked images we’ve seen previously. The phone is pictured to feature a matte black finish and a dual camera system. The fingerprint reader is expected to be placed at the front. Additionally, a full list of specifications has been leaked as well. Some key specifications such as display type, battery size, weight, and speakers are still missing from the list. Dash Charge 2.0 means that the OnePlus 5 will probably feature a USB Type-C port. 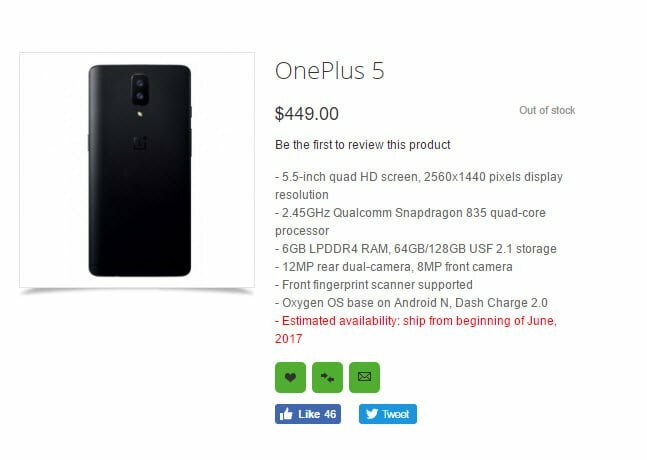 Priced at $449, OnePlus appears to be continuing its tradition of bringing high quality, flagship-level specs to a midrange price point. Users clawing at the screen looking for the buy button won’t have to wait long. The listing states that the OnePlus 5 will be available starting the beginning of June 2017.